Einhorn's Pharmacy was listed in the Manhattan telephone directory at 64 Fulton St. from 1929 to 1935. Then from 1936 to 1970 they were located at 70-76 Fulton St. on this southwest corner of Ryders Alley. There was also an S. Einhorn & Sons, Medical Supplies at this address from 1937 to 1939. S. Einhorn & Sons moved further downtown to 136 William St. in 1940. 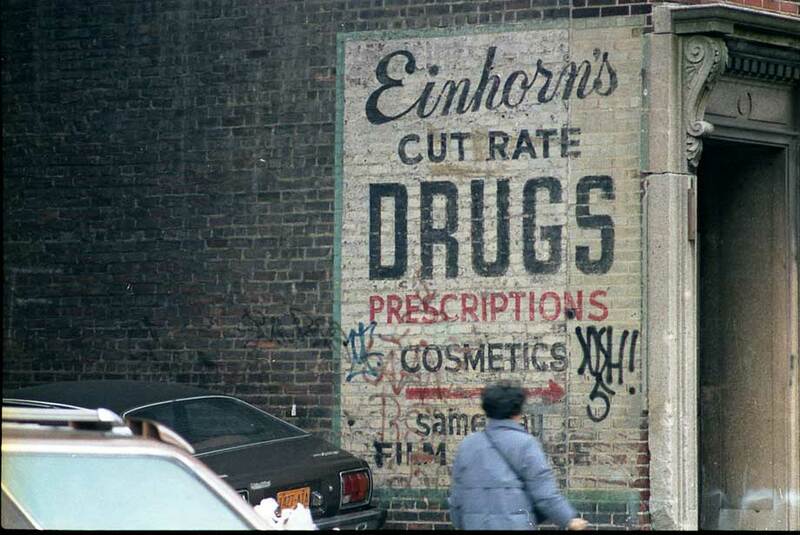 As of 2010 there was still an S. Einhorn & Sons (health care equipment) in New York City (1 Beekman St.). Polk's New York City Directory, 1933-34, listed the following at Einhorn's Pharmacy, 75 Fulton St.: Arthur, Fred T. and Samuel Einhorn. Samuel Einhorn, (1877-1944? ), was an immigrant from Russia. At the time of the 1910 U. S. Census he lived on DeKalb Ave., Brooklyn, and gave his occupation as "Salesman, Furniture." In the 1925 New York State Census he lived at 368 New York Ave., Brooklyn, and his occupation was recorded as "Tailor." In the 1930 U. S. Census he was a pharmacist. In 1942 he registered for the World War II draft, when 64 year old. At that time he still lived at 368 New York Ave., Brooklyn, and stated that he was born 15 Sept. 1877, in Odessa, Russia. Arthur Einhorn (1905-1988) and Fred T. Einhorn (1905-1989) were twin brothers born 16 May 1905. Both were recorded in the 1930 U. S. Census living with their father, Samuel Einhorn, at 368 New York Ave., Brooklyn. They were 24 years old, and their occupations were pharmacist.